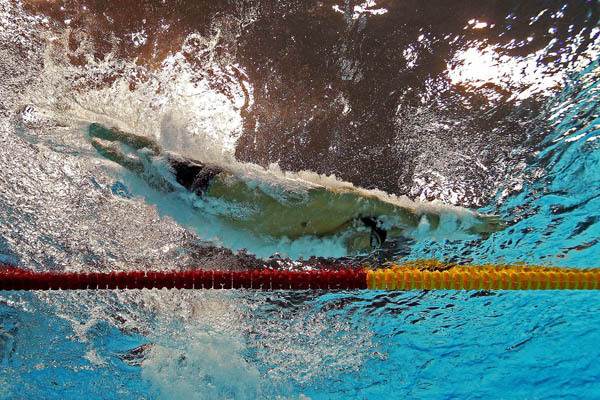 Michael Phelps of the United States dives into the pool in the Men's 100m medley Final on Day 8 of the London 2012 Olympic Games at the Aquatics Centre on August 4, 2012 in London, England. I arrived in London and got stuck on the airport elevator. Not a good start. Took a cab to my hotel and almost ran over an Urban Fox. Yes they have Foxes running around the city like stray dogs in America. From what I am told they are quite happy to live in the city of London. The weather changed quite a bit. One minute it was hot and the next it was cold and raining. It did not matter for me because my assignment was to cover all the Aquatics, which included swimming, diving, synchronized swimming, and water polo. All of the events were indoors. It was the first time in nine Olympics I was asked to work this way at one venue. In past Olympics, I traveled to different venues every day covering different sports. These games I was venue specific. I worked with my Getty photographer colleagues Clive Rose and Adam Pretty. We worked very well together. We had the responsibility of running three underwater cameras in three pools. We had the swimming and synchro underwater camera in one pool. The Diving and Water Polo were in another pool each. It took 4 years of tinkering to develop camera housings that were capable of running power, computer, and remote from the camera at the bottom of the pool to the pool deck at our position. A big problem was waiting for the newest cameras to come out to build the housings around. We decided to go with the Canon 1Dx bodies. They finally are full frame and really worked well for us. The systems we used were made by Sea & Sea in the Swim/Synchro pool and Aquatech in the dive and Water polo pool. What was great was that you could run Canon’s utility software from the computer, and see your frame in live view. You could also change your exposure, ISO, etc from the computer as well. One really cool thing during this Olympics was that the London Organizing committee had a full Scuba dive team to help us run the cables, provide air, and assist us to make our jobs easier. I look back now at the days where I was dropping a camera in the pool, holding my breath, setting everything while I was underwater. Technically it was easier because there was less to worry about like the computer not hooking up to the camera, or not enough power getting to the camera which would cause the Canon program to die and you are screwed. But it was also harder because you were not using Scuba, and to a guy like me who can only go about a minute on a good day underwater you need more time to set up. When everything is working right it is really good running things from out of the pool. Having Clive and Adam to work with was great because we are experienced in underwater photography. We helped each other every day. We rotated our underwater assignments fairly. One thing about working for Getty at the Olympics is that it is a team thing. There are no cowboys swanning around from event to event making a portfolio. In order for our venue to work we had to sacrifice a little bit. I kept telling myself that the pictures would come. Whatever position or assignment came my way I was going to do everything I could to get the best pictures I could. I was shooting some sport underwater everyday for 3 weeks. We set up for a week, and shot 16 days of the Olympic Games underwater. It was intense. It was stressful. We also had to shoot everything going on above the water. When you combine the two, you have defiantly got your hands full. All the work and preparation leading up to these 16 days was happening for better or worse. Up until the week of the games we were still working on getting the underwater systems right. A big problem was that the camera was not getting enough power to fire 12fps. If you blasted the camera too much then it would kill the Canon program. It was frustrating during the British, and USA Olympic Swim Trials but it turned out to be the best things we could have done. We got the kinks out and when things really mattered we had really good success with both housings. I had a few good Olympic moments. One was seeing Michael Phelps do his thing. He started slow, but really grinded and got his Gold medals and broke the all time record of any Olympian for medals ever. I was there to see that. 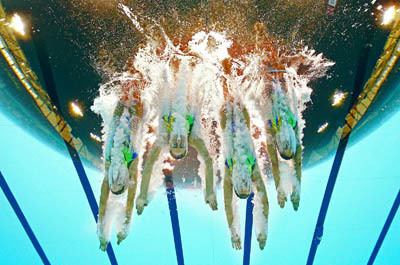 Great Britain competes in the Women's Teams Synchronised Swimming Free Routine final on Day 14 of the London 2012 Olympic Games at the Aquatics Centre on August 10, 2012 in London, England. One picture I liked was his last dive into the pool ever from underwater during the USA Gold medal 4x100 medley race on the last night. To me it was historic to get a shot of him blazing through the water like a rocket for one last time. I have shot Phelps from the beginning. I have had opportunities over the years to do photo shoots with him. We had become friendly with each other over the years and he has always treated me with kindness and respect. He is a great person. I got an emailed photo by Vaughn Ridley after his last race of me and Phelps talking during his last run around the pool after he got the FINA award for Outstanding Swimmer of the Games. It was cool because it looks like we were just having a stroll around the pool when in reality it was mass hysteria of TV and photographers swarming him. I almost fell in the pool myself. I will never forget that night. I remember tweeting that after Phelps retires; shooting swimming would never be the same for me again. I mean how many times in your life are you blessed to follow the career from start to finish of an elite athlete like this? The only thing I can kind of compare it to is covering the career of Derek Jeter of the NY Yankees. But I was not involved in any way besides game coverage of Jeter. Anyway, you get the picture. Other Moments I will remember at these Olympic Games are not involving athletes. They are involving the people I covered the games with. Working for Getty Images is very sacred to me. In my opinion I feel like I am working with some of the best sport photographers on this planet we call Earth. There is a storied history of Getty photographers dating back to the Allport days. (Getty bought Allsport in 1998). I am always aware of the footsteps I dare to walk in. I have a fierce pride for our work and what it takes to get the photos we get. Our support team of editors, IT, Managers Etc. are an amazing group as well. I try to instill my knowledge to anyone who asks me and feel it is part of my job to do so. What is great about our staff is that they are truly great people. I have true friendships that will last a lifetime. It is harder and harder to make true friends as you get older. I treasure every laugh, every joke, every meal I shared with my guys. On the Next to last day of the Olympics, Clive, Adam and I got in the dive pool with the Scuba dive team and had some time to do some funpix! We were all swimming around and taking photos of each other underwater for about an hour. We got a cool pic of the underwater team of us over the London Olympic 2012 sign with the rings at the bottom of the pool. It is a photo that means as much to me than any memorable photo I may have taken in my life. It represents to me all the hard work, dedication, sacrifice, and special bond we shared at these London Olympic Games that will carry over into the future. I have some observations about the London Games compared to the games in Beijing. The London games were as organized as Beijing. Security was swift and I felt safe. There was every colored Royal beret guard you could imagine. Some had weapons, others did not. But I felt safe. The London Subway system is really good. It got me to where I needed to go. The food was really good!! Really!! I still lost weight but that was from working so hard not from the food being crap. In Beijing I lost weight because I was not eating well and I was working flat out. The people of London were awesome. They seemed very genuine in their friendliness. In Beijing they were nice but I felt as if it were forced upon them to be friendly. I really loved London. This was one of my best Olympic games. If I had to be critical I would say it was with TV and not London. THEY WERE EVERYWHERE!!!! You could not swing a dead cat without running into a TV person getting in the way of your shot. It was comical!! Don’t get me wrong, the TV guys were just doing their jobs and were also very nice but it was crazy how fast they jumped into your frame after every race, or every jubo. I don’t know if it will ever go backwards. It just keeps getting worse. We also planned to have remote cameras on the pool deck and in the starting blocks before the races. We used them at the trials with no incident and got some cool stuff. That was vetoed once the Olympics started. Whether it was coming from FINA or TV I still don’t know but I think it was a little of both. Something as simple as placing an underwater camera by the goal of the water polo became a huge project once TV got involved. We were asked again and again to move the camera away from the net because you were in TV’s way. After awhile of moving the camera back you are like what’s the point here boys? Once they start splashing around you can’t see anything below the surface anyway. In the end I did get a few photos I was happy with. You always remember the pictures you tried to get but failed, but I am over it. During the Olympics you cannot dwell on any failure or mistake. If you let it get to you then you are dead. You need to move on, put your head down, and work. I never worked so hard in my life. I can honestly say I gave everything I had during these London Olympic Games and I feel good about that. Shooting the Olympics is a privilege not a gimmie. I cherish every opportunity I get to work an Olympics. Sochi and Rio are next. My goals are there. I hope to make it. Al Bello is a staff photographer with Getty Images. You can see his work at his Sports Shooter member page: http://www.sportsshooter.com/members.html?id=606. I also write a weekly column read it at ::..